Did you know that nearly a year ago, I had done my very first interior design podcast show appearance. It was for the Design+Style podcast with Rachel Moriarty & Dixie Willard. How crazy is it that nearing the anniversary of that show date, I can to bring you guys this episode, where I sit down and chat with Rachel. As something of a “visibility whisperer”, I got to discuss "Visibility Management" (as oppose to time management) with Rachel. We talk all about what it’s like navigating visibility opportunities while remaining on brand & in alignment, with some examples from recent collaborations. Rachel Moriarty wears many hats — from being a leading home style expert to best selling author to product designer. 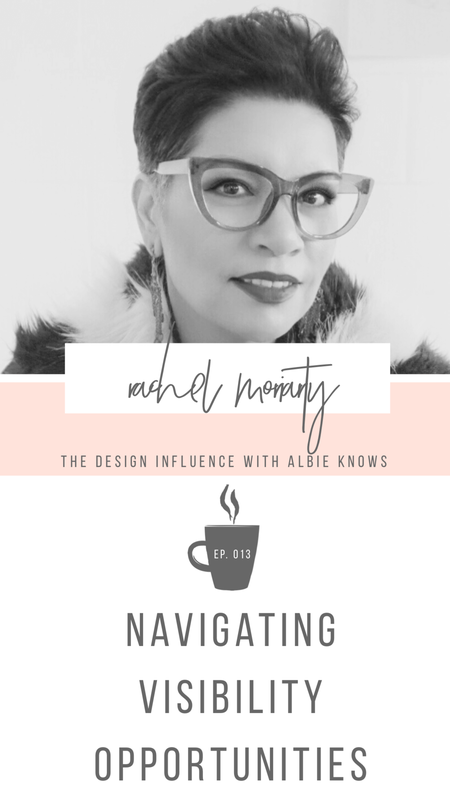 With more than 13 years of experience in design, her work as a photo stylist has also been published in home furnishing catalogs and industry magazines. A treasure huntress since the age of 12, her specialty is elevating spaces by incorporating her clients family heirlooms and she is known for her use of playful patterns and bold strokes of color. Besides home makeovers, Rachel's current projects include a new tile line with Elegant Mosaics and renovations for a new HGTV series scheduled to launch this year. As an expert in using her platform to fill her pipeline & build partnerships, I just know you guys are gonna love our conversation. Today we don’t just get into how Rachel leveraged her visibility for business opportunities, but we dig deep into how getting uncomfortable propelled her business in ways that she hasn’t even expected. We talk about things she’s done in her business, the strategies she’s used, to get herself seen and booked. Like I said, I know you’re gonna love this one! How inspired are you know to just go out, get uncomfortable, and be more visible? Most of us, while we know we should be putting ourselves out there, we get in our own way with excuses. Let Rachel’s story be the kick in the pants you needed. We’ve all been there — she’s been there — where we’re scared to be the face of a brand and we want our work to speak for itself. That’s great and all, but imagine how much more you could conquer if you spoke for yourself? That’s the lesson today & the proof is in the pudding. If you’re listening to this in real time, or close to, thats be sure to swing by and check out what Rachel & the 13 feet of Cohen Brothers are up to at High Point Market this weekend at the Zuo Decor showroom — maybe I’ll see you there! While listening be sure to tag @thedesigninfluence and @rachelmoriartyinteriors and let us know what your biggest takeaway was? When did the lightbulb go off for you while listening to the conversation? And what can you start doing differently or better after hearing Rachel’s story?